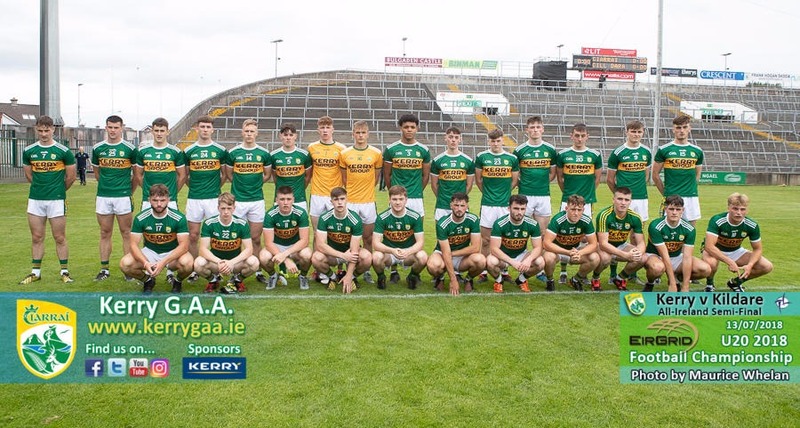 Jimmy Hyland scored 1-8 as Kildare just about held off a late Kerry onslaught in the Gaelic Grounds in Limerick to qualify for the first ever All-Ireland Under 20 Final. Scorers for Kerry: F Clifford 0-5 (5fs), M Potts 1-0, D O’Sullivan 0-2fs, C Linnane 0-1, B Friel 0-1, B Sweeney 0-1, G O’Sullivan 0-1, M Ryan 0-1, S O’Leary 0-1. KILDARE: Aaron O’Neill; Mark Dempsey, Mark Barrett, DJ Earley, Darragh Ryan, Jason Gibbons, Tony Archbold; Aaron Masterson, David Marnell; Stephen Comerford, Padraig Nash, Ruadhan O’Giollain, Jimmy Hyland, Brian McLoughlin, Paddy Woodgate. Subs: Shane O’Sullivan for Marnell (HT), Mark Glynn for O’Sullivan (35), Jack Bambrick for Ryan (38), Cian Costigan for Nash (44), Sam Doran for Woodgate (54), Niall Murphy for Hyland (60+2). KERRY: Brian Lonergan; David Naughton, Stefan Okunbor, Micheal Reidy, Mike Breen, Graham O’Sullivan, Daniel O’Brien; Mark Ryan, Diarmuid O’Connor; Fiachra Clifford, Eddie Horan, Dara Moynihan, Donal O’Sullivan, Bryan Sweeney, David Shaw. Subs: Sean O’Leary for Naughton (37), Brian Friel for Horan (49), Cormac Linnane for Shaw (51), Micheál Foley for Breen (53), Michael Potts for Clifford (55), Cian Gammell for Ryan (57).